Airberlin is adding three new routes to its Dusseldorf hub starting next Spring. All three routes currently have very good award space for two passengers during Summer 2016 in flat bed Business Class. You can book airberlin Business Class to Europe for 50,000 American Airlines miles one way, conveniently the exact sign up bonus of the Citi® / AAdvantage® Platinum Select® MasterCard®. This route will operate on Tuesdays, Thursdays, and Saturdays. Starting June 12, 2016, the flight will add a fourth weekly service on Sundays. The route will operate on Sundays, Mondays, Wednesdays, and Fridays. This route will operate on Sundays, Wednesdays, and Fridays. Starting June 9, 2016, the route will increase to 5x weekly flights by adding Monday and Thursday service. Bearing in mind that these flights only operate 3-5x weekly, award space is available on nearly every flight from their launches until the end of the schedule for two people in Business Class. Here is award space on the Dallas to Dusseldorf route in May and June. 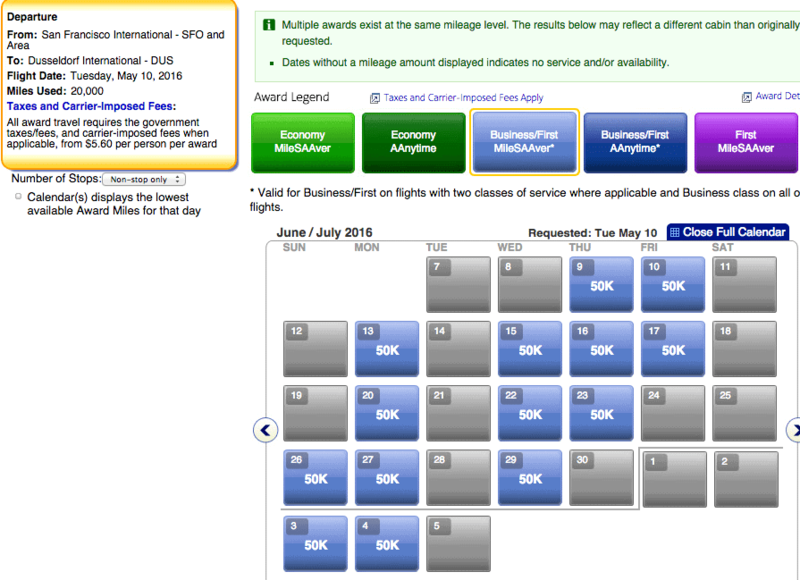 Here is award space on the San Francisco to Dusseldorf route in June. Here is award space from Boston to Dusseldorf in May. This award space is useful for getting all over Europe. Here are the possible connections to Dusseldorf. Ending anywhere in Europe will cost just 50,000 American Airlines miles in Business Class. According to aa.com, there is no award space on the Europe to USA portion of these three new routes. That’s only because the westbound version of the new flights don’t yet exist on aa.com. You can search return award space on ba.com and see that it is just as good from Dusseldorf to the US as it is from the US to Dusseldorf. Then you can call American Airlines at 800-882-8880 to book the westbound award space. Get both cards and meet the $6,000 total spending requirement to have over 106,000 American Airlines miles, enough for a flat bed roundtrip in Business Class to Europe on airberlin flights. I can’t see any of the return space, DUS to SFO, on BA. I want to travel in Oct, but searched for May as you do for a different routing, and still nil. Do you think I am doing something wrong, or award flights on that route aren’t available yet? Or maybe BA doesn’t show me partner flights because there are BA flights through LHR? Do you think calling AA would yield results? Thanks for any guidance you can provide! There was some when I searched, so the space is either gone or you’re doing it wrong. Probably the former. Calling AA would not yield results if it isn’t on ba.com.